Relatively few people put together (let alone complete) long-distance wilderness trips in the Alaska Arctic, and when we put together our trip we found little information about how best to travel through this remote corner of the world. 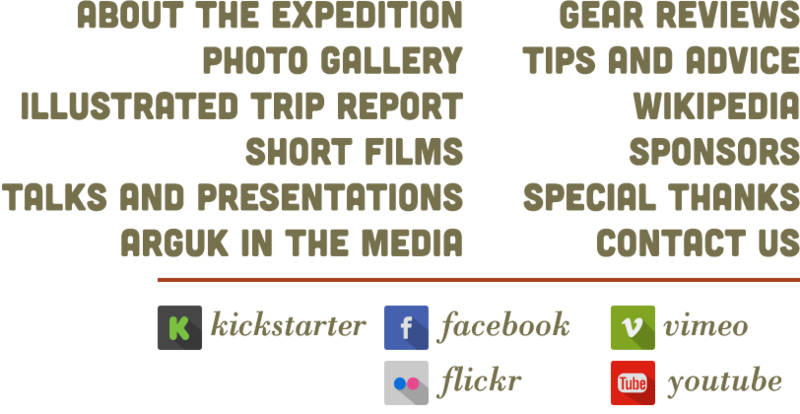 The purpose of this section is to allow us to offer tips and advice for people attempting similar trips. Please keep in mind that we were in the Arctic at a specific time of year (mid/late July to mid/late August), and only covered a small portion of this truly massive region. That said, hopefully our advice, taken in context, can help you plan your own adventures. Brett: "There’s a good reason why commercial fishing cooks get paid top dollar: when you’re cold, wet, and tired, there’s nothing that makes you happier than good warm food. In addition to packing food that will perk you up each day for an Alaskan journey, you may also want to think about stove, fire, and fuel choices to keep weight down and keep good food coming out of your camp kitchen. Interestingly, despite its status as a national park, fires are allowed in Gates of the Arctic (as well as many non-park portions of Alaska). This allows you to cook over open flame, which we did every day in lieu of expending fuel canisters. We still brought a stove and fuel cannisters as a safety precaution and in case we were in an area without wood. Over a long enough time span, saving fuel weight by cooking over open fire can significantly reduce pack weight. If you’re going to cook over an open flame, bring foods that cook when added to hot water (instead of needing a bit of cook time) to prevent scorching. You don’t get flame regulation when you’re cooking over an open fire, nor do you get to stir the pot much unless you’re brave. Make sure that your pot can tolerate extreme heat, and be comfortable with the warping and discoloration that will occur." Brett: "Choosing footwear is one of the more important decisions that you’ll have to make for any trip in any environment, but especially in Alaska. There’s a good reason why Jack London wrote an entire story, To Build A Fire, about the fate of a miner who soaked his feet and could’t get them dry again (spoiler alter: he dies). In the Alaska and Brooks Ranges, the lack of trails makes footwear even more important. Here, where tussocks and brush reign, some of the best travel is on river beds or, in a pinch, sometimes in a river itself. This means that wet or damp feet is a virtual guarantee. Add that to a large pack, and it becomes clear that a good boot must do the following: 1) keep your feet happy when wet, 2) support a heavy load, and 3) handle a good thrashing. On our trip, our boot choices fell into two categories, those that chose more classic high-top leather boots, and those that took a more modern approach with a high-top mesh-sided hybrid that attempts to blend the support of a high-top hiking boot with the comfort and drainability of a trail runner. Expedition Arguk's Brooks Range footwear. From viewer's left to right: Solomon suede leather/mesh boots, full-grain leather boots, Solomon mesh hiking shoes, and Zamberlan full-grain leather boots. I’ve worn the same pair of Zamberlan high-top classic leather boots for my entire life, and when I’m carrying more than 20 pounds it’s all I ever wear. For full disclosure, these boots are broken in to my feet and vice versa, and they’ve never let me down. Here’s how the boots performed: Over 75 miles of hiking through the Brooks Range, classic leather boots were superior in support. Both expedition members who opted for classic leather boots didn’t become footsore or have ankle problems, although Chelsea developed some awesome heel blisters. Our two group members who opted into the lightweight hikers (who are both strong, skilled outdoorsmen by many measures) both had trouble with ankle support that ultimately grounded one for a few days, the other for the entire trip. Both boots suffered small but significant damage in just a few weeks of constant use. In terms of drainability, the lightweight hikers didn’t even really excel in keeping their wearer’s feet dry. Until this new genre of boot is better designed, saving a little weight on your feet isn’t worth a stability compromise. Wait for the design flaws of these boots to shake out before investing in them. Until then, go high-top full grain leather. I recognize that designing a boot that has good support and dries quickly is a goal worth pursuing, even if it takes a few iterations. However, taking anything less than the support you truly need into the Alaskan backcountry is perhaps not the best gamble." Paxson: "It's true that the two members of the trip that wore lighter boots (myself included) had trouble with sore Achilles tendons, but it's also true that we both were coming from Brooklyn, where proper training for hard hiking on uneven terrain was virtually impossible. I personally felt that my leather and Gore-tex Solomon hiking boots were stable, comfortable, and provided great support. I would not write off any category of shoe per se, but would say that you must have a boot that suits your foot and your level of training. The terrain in the Brooks Range can be extremely challenging on your feet, particularly the tussocks, and you may want more support than backpacking normally calls for. I would only wear trail runners in the Brooks Range if I were carrying a light load, were very well-trained, and had to hike quickly. Make sure your boots are broken in and you have trained extensively on uneven terrain. As Brett explained, the Brooks Range is wet and, unless you wear non-waterproof and fast-drying trail runners, your feet will get wet. In fact, the waterproofness of durable hiking boots ironically works against you in the Brooks, because the cool weather and wet terrain make it very hard to get waterproof shoes dry once the insides get their first soaking. Drying shoes out by a fire is perilous, as differential drying can cause the shoes to warp, or cause leather to tighten up and pull off of the sole (not to mention you can burn your shoes). Ultimately, it's better to work with some level of dampness, rather than continually trying to fight it. I would recommend multiple pairs of socks, and, in particular, avoiding blisters by wearing a pair of very light liner socks inside of your backpacking socks. Overheating in your boots will almost certainly not be an issue. As to the packrafting portion of the trip, trail runners, sandals with waterproof socks, or river shoes would have been nice. Because you push your feet up tight into the bow of the boat, burly hiking boots with wide, knobby soles aren't ideal. Do keep in mind, however, that if you have to wrap up the boat and hike with your paddling gear on your back, the normal advice about sturdy boots applies." Brett and Luke modeling the height of Brooks Range fashion. 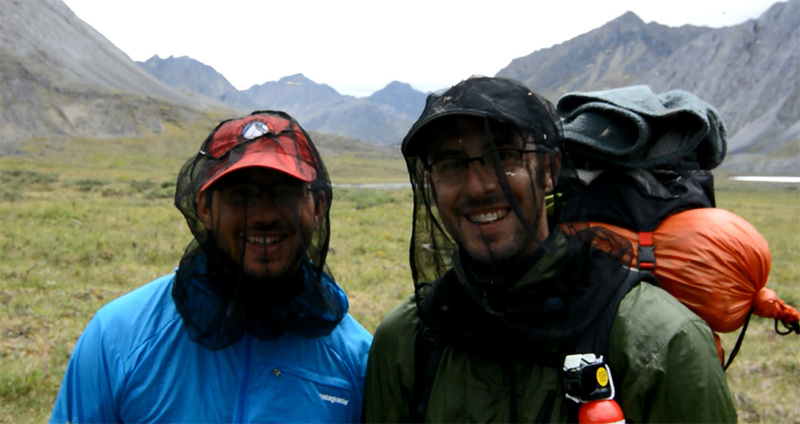 Mosquitoes are a constant annoyance in the Arctic, but headnets, long sleeves, and pants keep you hiking happy. Brett: "Nothing can take the wind out of your sails like bad bugs. Outside of perhaps the Everglades, Alaska has some of the worst mosquitoes on the planet. It is part of what makes hiking in Alaska such a paradox: the views can be magnificent and the mosquitoes magnificently bad. Even during moderate rain, the mosquitoes were still swarming during our trek. Most people will tell you to soak yourself in DEET, and to soak your gear in Permetherin, a nasty substance that’s not even supposed to touch your skin. We, however, don’t recommend any of that cancer-causing stuff that will have you growing tentacles in your 40’s. Alaska is cool enough that a versatile pair of pants, a light windbreaker like the Patagonia Houdini (see review), and a headnet will keep you comfortable, skin-cancer free, and keep the bugs at bay. If you can find something to eliminate the buzzing noise, please let us know!" Paxson: "The Alaska Arctic is legend for its airborne plagues of mosquitoes and other blood-hungry insects. While mosquitoes can be tremendously annoying, they are one of those rare wilderness problems that can be solved easily and completely, with a bit of black mesh. A light windbreaker, long pants, and a mosquito headnet eliminate the problem just about 100%. While floating down (or walking up) rivers, or in the higher passes, the mosquitoes were all but nonexistent. In the valleys (and particularly around swampy tussocks) the bugs were bad, but considering the ease with which this problem can be solved, mosquitoes and their cohorts simply shouldn't discourage anyone from exploring this spectacular region." 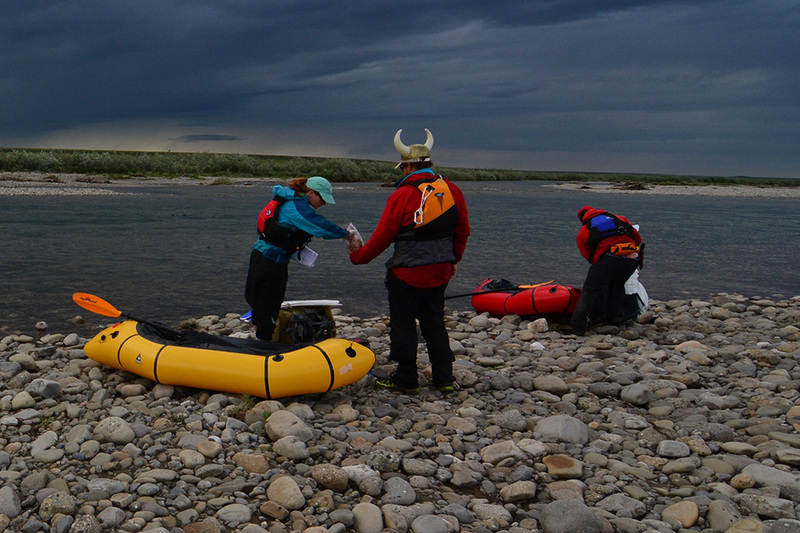 Stopping for a quick snack on the Anaktuvuk River. Paxson: "We ate primarily lightweight dehydrated food, suplemented with fig bars, sausage, cheese, and that most valuable of backcountry commodities: powdered black coffee. In Gates of the Arctic National Park, there are strict rules about keeping your food in bear resistant canisters (BRC's), so keeping bulk down is important for longer trips. We saved space by removing much of our food from its original wrappers, and packing it instead in larger plastic bags. The Arctic has a large bear population (black bears in the woods in the southern Brooks Range, grizzlies throughout, and polar bears closer to the ocean). Bears may be unfamiliar with humans, and therefore more curious of unfamiliar or appealing food smells than they should be. Minimize encounters by avoiding smelly foods. In places where it is legal for hunters to use bear attractants, they often use honey, molasses, strong-smelling fish or meats, anise and vanilla extracts, and fruit jelly and Jell-O. I would not bring food items, such as smoked salmon or caribou, that are both smelly and part of a bear's natural diet. It may not be possible to avoid all of these items, but minimizing them is probably wise. Keep a clean camp, cook far away from your tent, and store your food properly. Aside from the bear issue, properly storing your food will ensure that it isn't raided by any of millions of small mammals that live in the Arctic tundra. Fishing is legal in much of the Brooks Range and Arctic, and provides a nutritious and tasty break from backpacking fare. Look up fishing regulations before you leave, and catch, clean, and cook fish as far away from camp as is reasonable. Keep all fish smells off of your clothes. Though the Arctic is known for a few stupendous fishing spots, don't rely on fish for your daily calorie needs. In general, the fish are small, and few and far between. Be respectful toward the North Slope communities, which depend on subsistence hunting and fishing. Don't fish too close to villages or in local fishing holes. Wild blueberries grow throughout the Arctic. Compared with store-bought berries they are oval-shaped, small, and have a strong, sweet, complex flavor. They are healthy and delicious. Year-old cranberries, which have made it through the winter, are dark mahogany red and bursting with a sugary, pungent, slightly alcohol-laced flavor that is unlike anything else. Make sure you know how to ID berries or other natural edibles, as you are far away from help if you get sick. If in doubt, don't eat it." Paxson: "We spent several days each in two remote North Slope villages, Anaktuvuk Pass and Nuiqsut. The villages are small communities where everyone knows everyone else, and in some ways they are very different from what you might consider mainstream America. Both towns are small and dense, with small, utilitarian houses packed tight on modest lots. There are very few commercial operations, and the villages are not oriented toward tourism. There are US post offices, schools, and some other minimal government services in both villages. The inhabitants are majority ethnically Inupiat Eskimo, and many speak both English and Inupiaq. 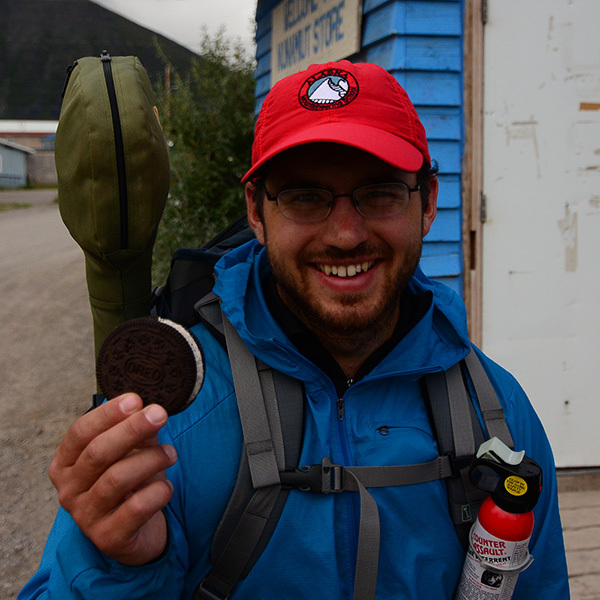 Brett proudly holds his birthday ice cream sandwich outside the general store in Anaktuvuk Pass. In both Anaktuvuk Pass and Nuiqsut, commercial activity is limited mostly to purchasing items at the general store, and hot food at the hotel/work camp kitchens. Other services and products are available informally, and you may have to ask around. In both towns, just about everyone who passed us on the roads waved, and people were overwhelmingly friendly, open, and curious. Residents would stop us to ask where we had come from, how the trip was going, and how we liked the village. We were frequently greeted with a genuine smile and a cheery "Welcome to Anaktuvuk Pass!" or "Welcome to Nuiqsut!" That is not to say that there are no sources of potential tension. Subsistence hunting and fishing are central aspects of life in Anaktuvuk Pass and Nuiqsut, and there is resentment against fly-in sport hunters who are perceived as taking animals from the community and potentially disrupting migrations. Many locals opened up to us immediately when we told them we were not there to hunt. People in the villages are also wary of being used or manipulated by outside interests for political purposes. For many decades, government and commercial entities treated the Arctic carelessly, leaving severely polluted sites and exploiting resources without adequately involving or compensating the indigenous people. Oil development is particularly controversial and divisive within villages, particulary in Nuiqsut, which sits adjacent to the Alpine oil field and has a mixed relationship with the oil companies. There have been racial tensions in many villages in the past, but we did not experience any hostility whatsoever. Both villages are "dry", and alcohol is strictly prohibited. There are also limits on firearms. Anaktuvuk Pass: Anaktuvuk Pass is tucked into a sweeping valley in the central Brooks Range, and straddles the continental divide between the Pacific Ocean and the Arctic. The resients are primarily Nunamiut Eskimo people, a group of Inuit who traditionally lived inland and hunted caribou. As it is the only settlement in the Brooks Range, the village is familiar with backpackers and has set aside a plot of land on the far side of the small airport for camping. The informal campground has ample room to pitch tents and fresh water is available from the adjacent John River. There is a small "work camp" with a kitchen, where skilled non-resident workers stay, and where visitors tend to congregate. After much searching and some confusion, we were able to pay our way into the work camp showers for $5 apiece. The general store is moderately well-stocked, and expensive. There is a small museum. The small-plane airport has regular commercial air service. The USPS has irregular hours, but can hold packages. Nuiqsut: Nuiqsut is situated on the Nigliq Channel of the Colville River, just over a dozen miles from the edge of the Arctic Ocean. It sits high on a riverbank, surrounded by vast stretches of flat, wet tundra. Unlike Anaktuvuk Pass, very few tourists or travelers come through Nuiqsut, and our presence there was something of a novelty. When we walked into town everyone seemed to already know who we were; throughout our stay we were "the kayakers". Though we had been repeatedly warned that Nuiqsut can be hostile to outsiders, we found the people to be just as friendly as those in Anaktuvuk Pass. Oil development has brought both clear benefits and problems to the village, and is a source of ongoing controversy. There is a large general store (as in Anaktuvuk Pass, prices are high), post office, and school. The town hall has a wealth of historical photos and documents. We were told we could camp anywhere, and set up next to the hotel, on the edge of town. The hotel is clean and well-kept, and serves surprisingly good and reasonably-priced hot food. Staying at the humble hotel is expensive: if I recall correctly, around $200 per person per night. There is regular commercial air service through the airport. Though a handful of scientists, engineers, and oilfield workers pass through Nuiqsut while working on various projects, it would be a good idea to check in with town hall if you plan on coming on a more unusual trip, as we were. We got the impression that the residents of Nuiqsut like to know who is in their village, and why. Caution: Under absolutely no circumstances should you camp on or near native allotment land surrounding Nuiqsut. These private holdings are unmarked and unsigned and it is your responsibility to know where they are. Do not approach any structures, even if they appear abandoned. Contact local and regional native corporations, BLM, and/or the DNR in Anchorage for current land designations. While planning our Expedition, we mainly focused on the villages as potential resupply points and airport hubs. We entered both Anaktuvuk Pass and Nuiqsut with hesitation, unsure of how we would be received. In fact, we were treated with great hospitality and true friendliness, and the endlessly fascinating conversations we had with residents were some of the highlights of the trip. We met one older traveler in Anaktuvuk Pass who had flown in to go hiking, but had become so enraptured with the people and the community that he had simply stayed in town. He was convinced that they were as close as any to finding a perfect way of life. Though the villages are not without their problems, and staying in them as a backpacker can be tough in some ways, the villages and their unique culture should be seen as one of the best features of any trip to the Alaska Arctic." Paxson: "If there's one backcountry issue that will pit friend against friend and neighbor against neighbor, it's the impassioned, endless debate about bear protection. The first thing to remember is that fatal bear attacks are extremely rare, and very far down on the list of dangers in the Alaska outdoors. That said, taking proper steps to prevent a bad encounter, and come out on top of one if it does happen, is simply common sense. Brett and Luke hike through the the Brooks Range, with red cans of bear spray clearly visible on the front of their backpacks. As our primary form of protection, we each carried a full-sized canister of pepper spray, usually strung in a loop on the front of our packs where it could be deployed in a matter of seconds. When packrafting, my pepper spray was attached to the outside of my backpack on the bow and could be easily reached. Many bad bear encounters happen when bears and humans startle each other at close quarters, and pepper spray in your backpack will be useless. There is thorough, reliable evidence that pepper spray is effective in deterring bears, and in fact, good reason to believe that it is more effective than a gun in many situations. 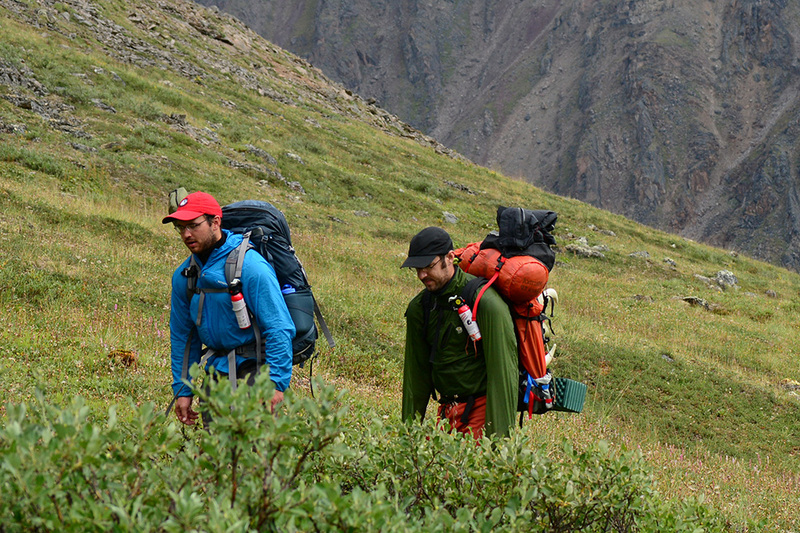 Most long-distance backpackers in the Brooks Range bring only pepper spray. One nagging problem with pepper spray is that it usually isn't allowed on larger commercial flights, even if it's checked, because of the fear that it will leak during the flight and incapacitate a pilot. Brett carried a Smith and Wesson ultralight revolver. While a gun may feel like the safest form of protection, there are some arguments against it. It's much heavier than pepper spray, especially when you factor in adequate bullets and a holster. While the sound alone may startle a bear, your aim must be pretty good to hit a charging animal with little warning. You also run a risk of accidentally shooting a person in a chatoic situation. Still, for experienced shooters, a gun has its merits. Firearms can be checked onto any commercial flight if they are in a case, and are the preferred method of protection in polar bear country. We also carried an ultralight electrified camp fence. These fences are still relatively new and ours had flaws that affected its performance and reliability, but fences, properly deployed, have a solid early track record at keeping curious bears out of camps. Our main motivation for using the fence was to protect ourselves from bears that have associated human camps on the Colville River with calorie-rich hunting scraps. The fence also gave us an extra level of reassurance when camping in polar bear country. Better than defending yourself against bears is not attracting their attention in the first place. Cook far away from your tent site, and, if storing your food in bear-resistant-containers, keep food at a significant distance as well. It's said that bears have the most powerful noses of any animal on the planet, and they're naturally curious. Don't bring strong-smelling food or hygeine products, and don't bring foods that are part of a bear's normal diet. If you catch fish, cook and eat them far, far away from camp, and keep your clothing clean. Don't camp on game trails or in places where animals must pass to get from one region to another. Bears will often go out of their way to avoid you, or ignore you altogether, but if you plop yourself right in their path, they're more likely to bump into you. Like the overwhelming majority of backpackers in Alaska, we had no negative experiences with bears. We saw three grizzlies, and all three ran away as soon as they saw us. The polar bear ignored us completely."